The stability of the power distribution network is very important for embedded designs with DDR memory interfaces. Whereas DDR3 memories tolerated 75 mV (Vpp) ripple, this has decreased to only 60 mV (Vpp) for DDR4 memories and is likely to decrease further in the future. Ripple and noise on the power distribution network negatively impact clock and data jitter, which has a direct impact on data transfer performance. 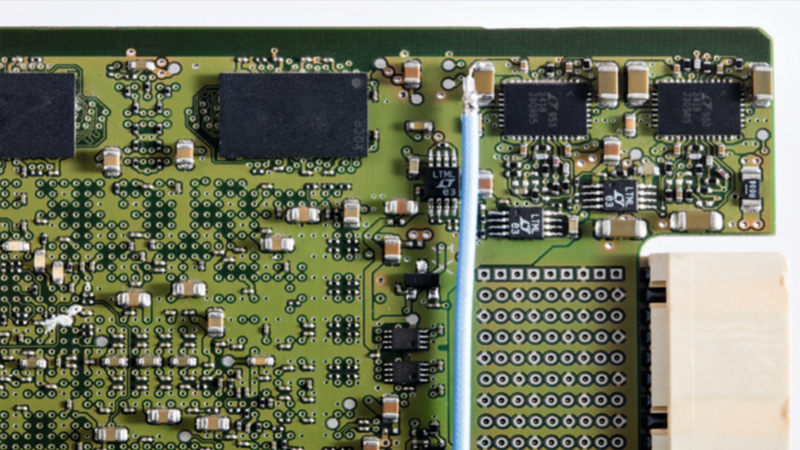 Qualifying the power distribution network of embedded designs with DDR memories is therefore a crucial task. The R&S®RT-ZPR20 power rail probe is a specialized oscilloscope probe for very low-noise measurements on power rails. This active 1:1 probe with integrated offset allows you to zoom in on the ripple sitting on top of the power rail voltage. 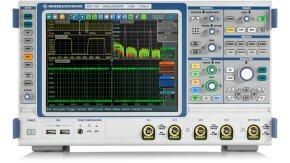 It is compatible with the R&S®RTE and R&S®RTO digital oscilloscopes, adding only 10 % of noise to the oscilloscope for accurate measurement of ripple and noise components. 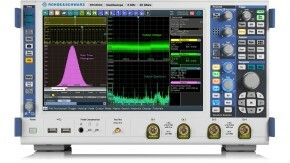 The probe has a 2 GHz bandwidth to see high-frequency transients or unwanted RF signals coupled into the power rail. Due to the slow frequency rolloff, the 2.4 GHz band can be covered with only slightly more attenuation. 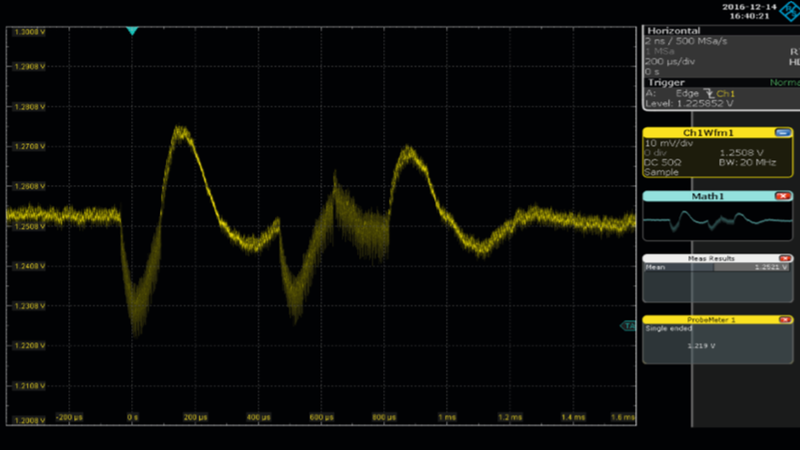 At 50 kΩ, the probe has a much higher DC impedance than a direct coaxial connection and therefore does not significantly load the power distribution network. The R&S®RT-ZPR20 probe’s browser extension is the perfect tool for verifying the DC levels of multiple power supplies on a PCB. 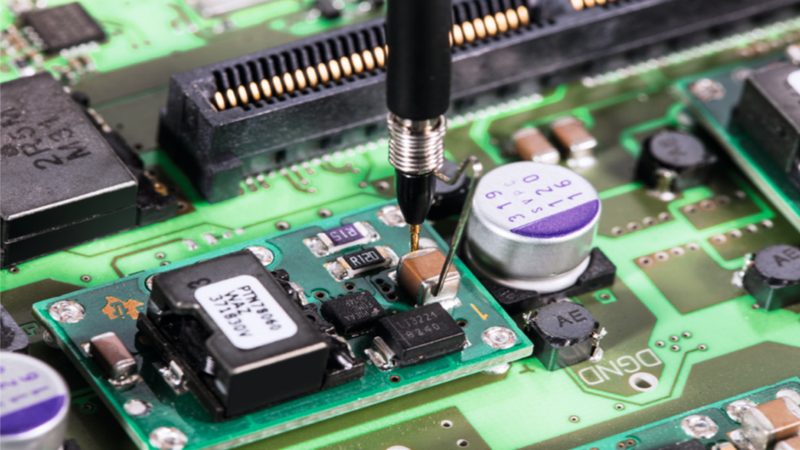 The accuracy of DC supply voltages can easily be qualified with the R&S®ProbeMeter, a highly accurate DC voltmeter integrated into the probe head. It offers 0.1 % DC accuracy irrespective of the offset voltage and eliminates the need for a separate DC voltmeter. The 350 MHz browser extension makes checking all power rails on a PCB an easy task. A browser accessory such as the SMT clip or the dual pin adapter provides an alternative way of connecting to the DUT if measuring with the ground spring is not convenient. 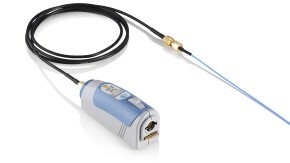 Pigtail cables do not limit the bandwidth of the probe and provide excellent connectivity right where the measurement has to be taken. 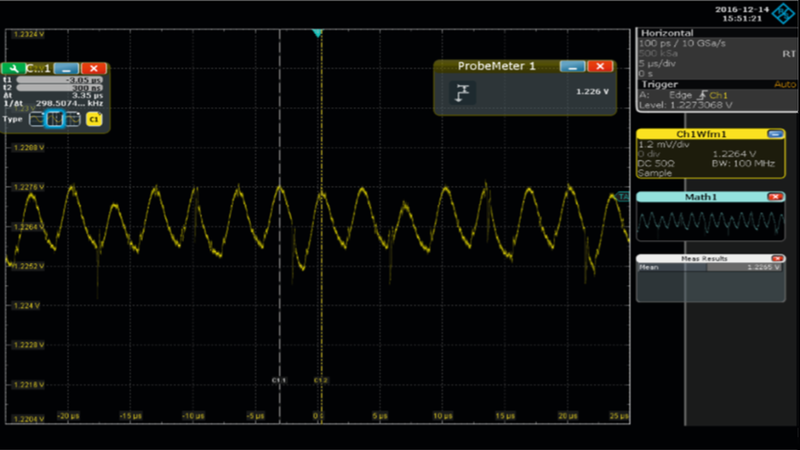 Measuring remaining ripple on a 1.2 V DDR4 power supply and accurately verifying the DC level with the R&S®ProbeMeter, a DC voltmeter integrated into the probe head. Load response measurement of a DDR4 power supply during initialization phase of the DDR memory. Accurate ripple and noise measurements on power rails require a high-bandwidth oscilloscope and a dedicated probe to perform low-noise measurements and provide the offset capability to zoom in on top of the DC voltage. 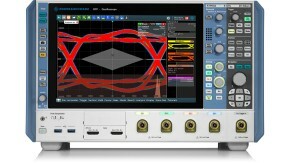 The R&S®RT-ZPR20 power rail probe as well as the R&S®RTE and the R&S®RTO digital oscilloscopes are excellent tools for this measurements.